VITEEE 2019 Slot Booking – VIT University started VITEEE Slot Booking 2019, on March 28, 2019, at vit.ac.in. 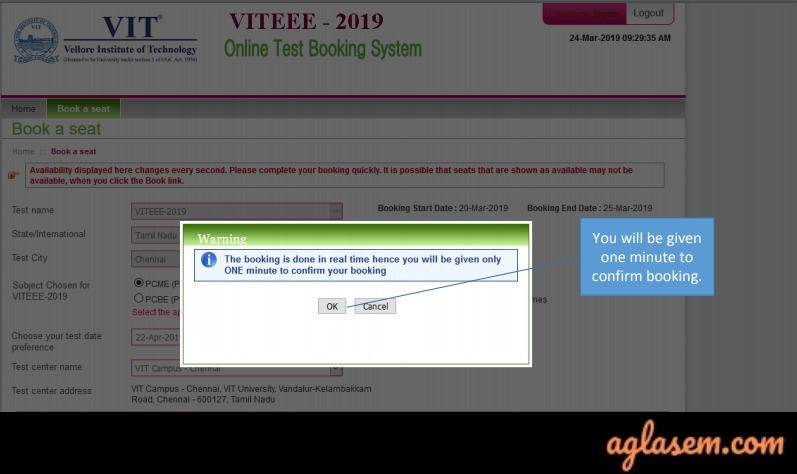 The slot booking of VITEEE 2019 was done through VIT Online Test Booking System (OTBS). Link for VIT OTBS is given below. To do VITEEE Slot Booking, application number and password is required. Slots are filled on a first-come-first-served basis, so do not delay. 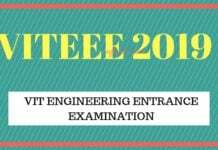 VITEEE 2019 will be held from April 10 to 21, 2019, and after the booking, candidates will get admit card. 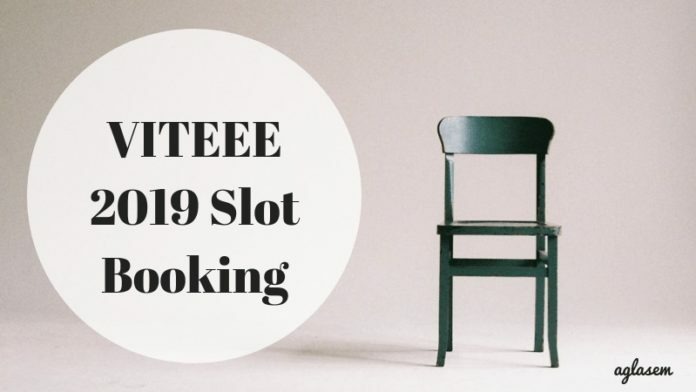 Know more details about VITEEE 2019 Slot Booking from this page. Latest: VITEEE 2019 Slot Booking has ended. Candidates can reprint their admit card. Details here. 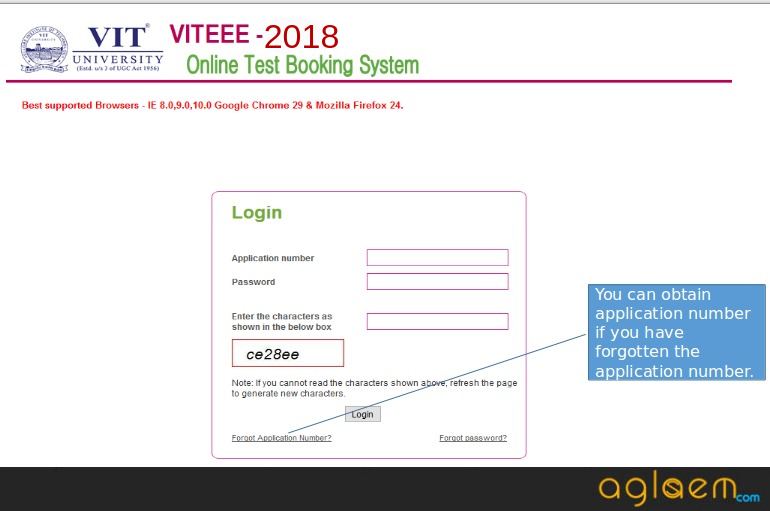 VITEEE 2019 Online Test Booking Password – 2 to 3 days before VITEEE Slot Booking, the university sent booking OTP to candidates via SMS. It is an important OTP, which University will not send again, as it is needed to login and to the do the booking. Choosing Test Subjects: Candidates should choose PCME (Physics, Chemistry, Mathematics, English) if they are applying for B.Tech course. However, candidates opting for Bio.Tech should choose PCBE (Physics, Chemistry, Biology, English). How to Do VITEEE 2019 Slot Booking? Password – The OTP sent by the University. Captcha – As displayed on the screen. 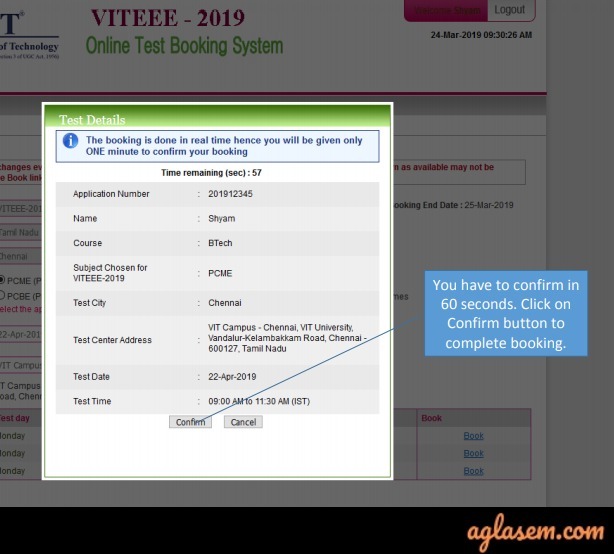 Once the details have been entered, click on the ‘Login’ button and process further with VITEEE 2019 Slot Booking process. 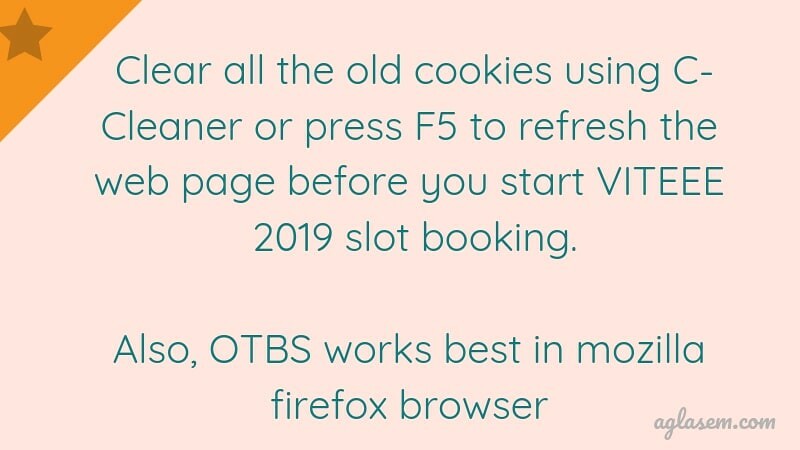 Step 2 – Opening the VITEEE 2019 Slot Booking Window: Once the VIT OTBS opens, check the box for “Please click the checkbox and proceed for the slot booking”. After doing so, a new page will open and candidate needs to click on “Book a Seat” button. Test Name – VITEEE 2019. State / International – The place from where you belong to. Test City – Choose the city in which the candidate wishes to appear for the exam. Subject Chosen for VITEEE 2019 – PCBE or PCME. Choose Your Test Date Preference – Click on the calendar at the side and choose the date, month, and year. Test Center Name – Here, the candidate needs to select a VITEEE exam centre in the chosen city. Test Center Address – It will be automatically displayed after choosing the centre name. Note: Under no circumstance, the request to change the subject will be entertained. So, make sure you fill it correctly. Step 4 – Book VITEEE 2019 Slot: After filling the details mentioned above, the available slots will be displayed on the screen. In it, the candidates will get to see the available seats, in a particular center on a particular date. Click on the ‘Book’ button to select the desired VITEEE 2019 Slot. After this, the candidate has to click on the ‘Ok’ button to confirm the slot and to go one step near for successfully doing VITEEE 2019 slot booking. 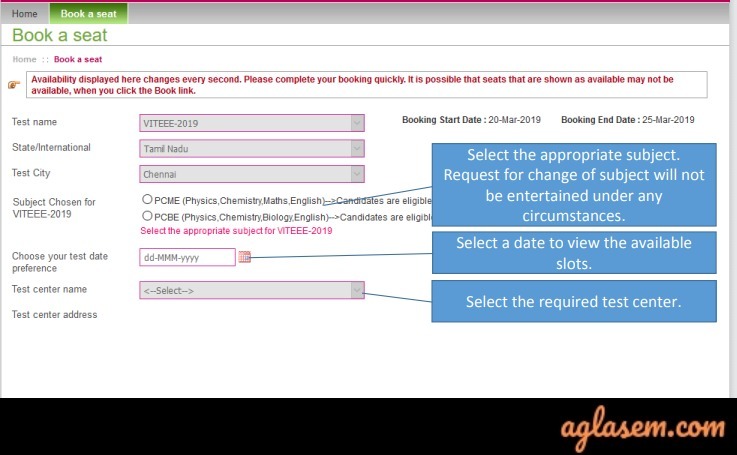 Step 5 – Confirming the Booking: To conclude the VITEEE 2019 Slot Booking process successfully, the candidate has to ‘Confirm’ the slot. Important Note: It is very important to remember that VITEEE OTBS is a real-time application and the candidates need to book the slot within a minute or it will automatically logout and the candidate will have to go through the entire process again. Also, since the booking is done on the first-come-first-served bases there is no guarantee that in second-chance candidates will be able to book the same slot. So, better do it quickly and correctly. Forgot Application Number Or Password? Here’s What Should You Do! 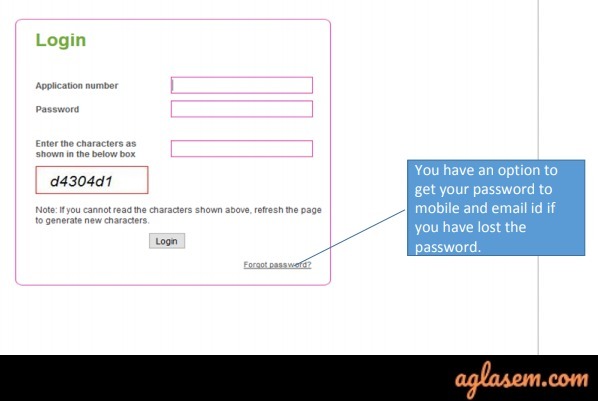 In this case, click on “Forgot Password” Link. 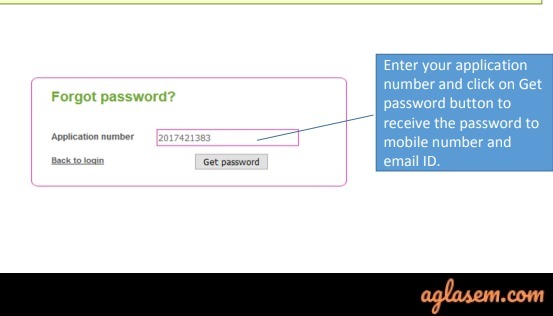 The system will display your password or send it to your registered email address. Firstly, click on the “Forgot Application Number” link. it is given in at the end of VITEEE OTBS. -E-mail ID and Security code. Then click on the ‘Submit’ button. The University will be sending you a link over your registered email ID which will help you regain your VITEEE 2019 Application Number. Online Test Booking System (OTBS) on VIT University is an online portal. The University has created it, so that the candidates can easily book their slot. It only opens for a specific duration, in which candidate do VITEEE 2019 Slot Booking. Once, the process is over, the University closed it. It only opens at vit.ac.in. To access it, application number and password is needed. It is a real-time application, which continuously keeps on updating the data of available and booked slot. 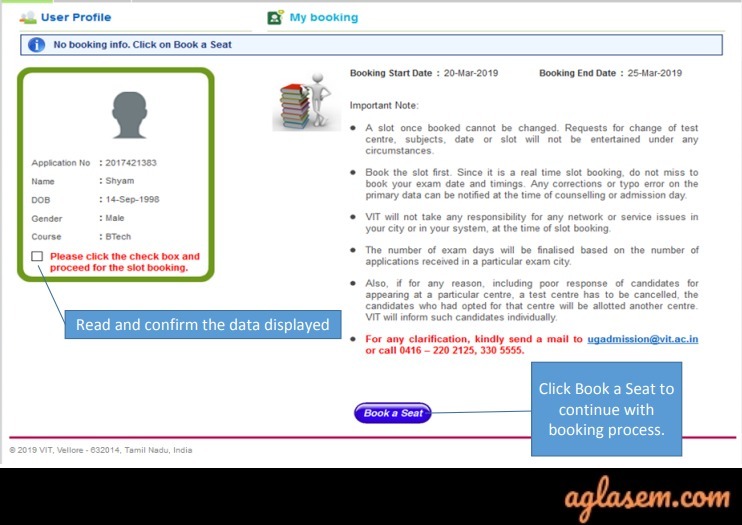 A candidate can only access it once for booking the slot. The OTBS does not allow candidates to change VITEEE slot, date, or centre. 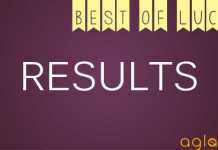 After the slot booking, the candidates can download VITEEE 2019 admit card from the OTBS. 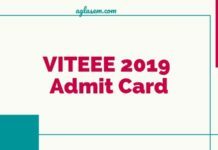 Candidates will be able to download the VITEEE 2019 Admit cards after they are done with the slot booking. The system will generate it automatically and the candidates can download it by clicking on “view my e-admit card” link. The admit card will be made available in pdf file format, which can be downloaded following these steps, listed below. 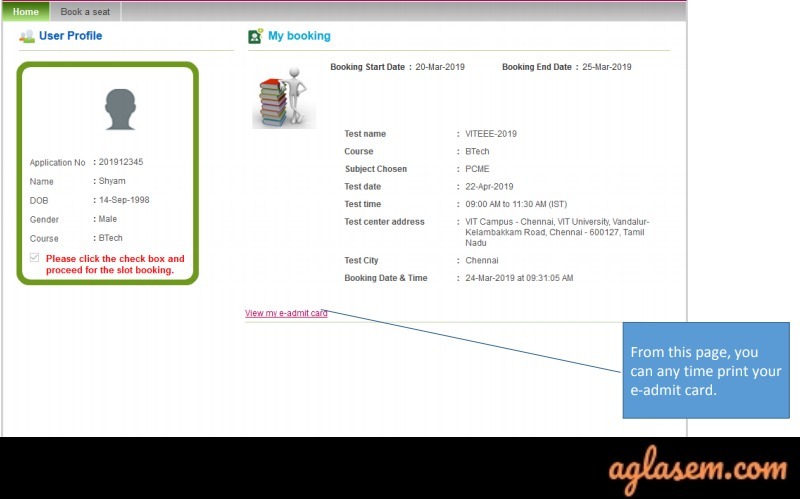 After the VITEEE 2019 slot booking, click on the “view my e-admit card” button. 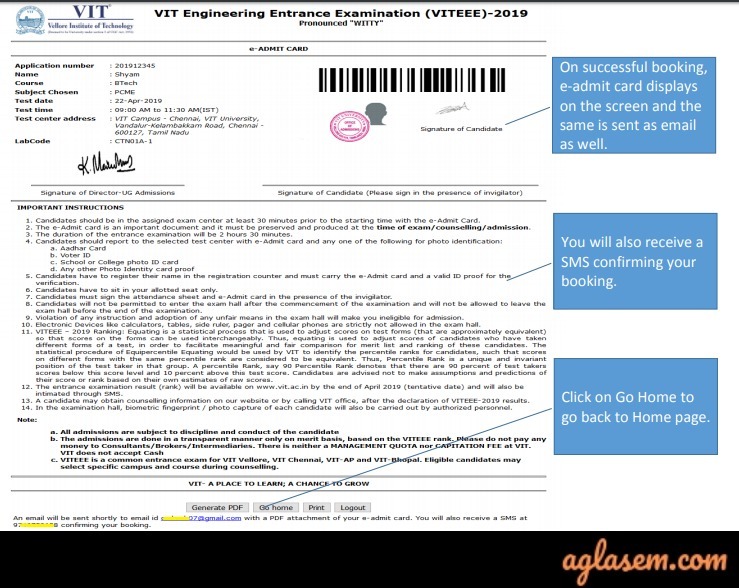 As soon as the candidates will click on it, the admit card of VIT will appear on the screen. Check all the details mentioned in it, prior to downloading it. Even if you have selected the subject while filling the application form, make sure you select the same carefully in the slot booking process too. They cannot be changed later on. In case of any correction or typo error on your Name / Date Of Birth / Gender etc., do not worry. They can be corrected at the time of counselling and admission. If Photo/Sign is not printed on your Hall Ticket, do not panic. Carry one passport size photo with one valid photo identity proof to the Exam center without fail. Make sure you refer to exam schedule and slots mentioned city wise above on this page before starting the slot booking process. The Exam Test City / Test Cente / Exam Date / Slot / Subject selected by you in the slot booking process, will not be changed under any circumstances. VIT is not responsible for your system failure or any local network failure during the slot booking. Thus make sure you check them beforehand. 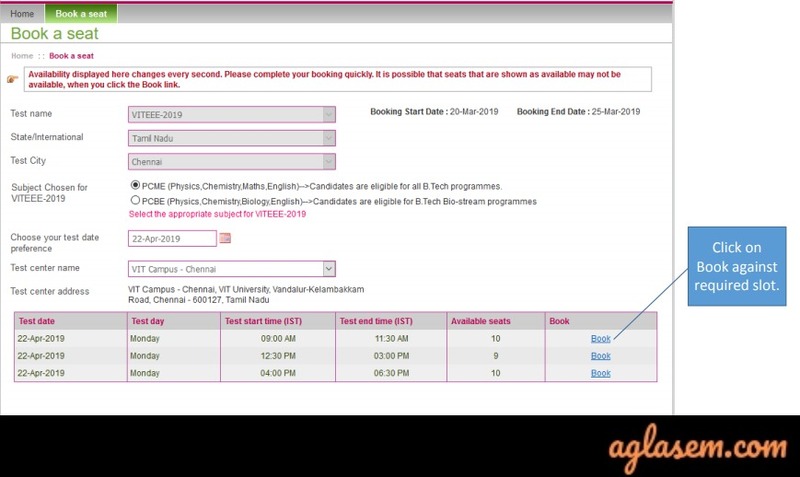 The VITEEE 2019 slot booking is a very good opportunity for the candidate to select test date and time. Usually, engineering aspirants apply for more than one engineering exam. In this, there is a high possibility of a clash in the exam date. However, due to slot booking, the candidates can choose a test and date on which they can appear for the exam without any hindrance. Before VITEEE slot booking 2019, do check exam date for all the other examination. Do not choose a slot just because your friend is booking it. Make your own decision. If you are choosing a centre in a different state or city, make early arrangements to reach the exam hall on time, on the exam day. 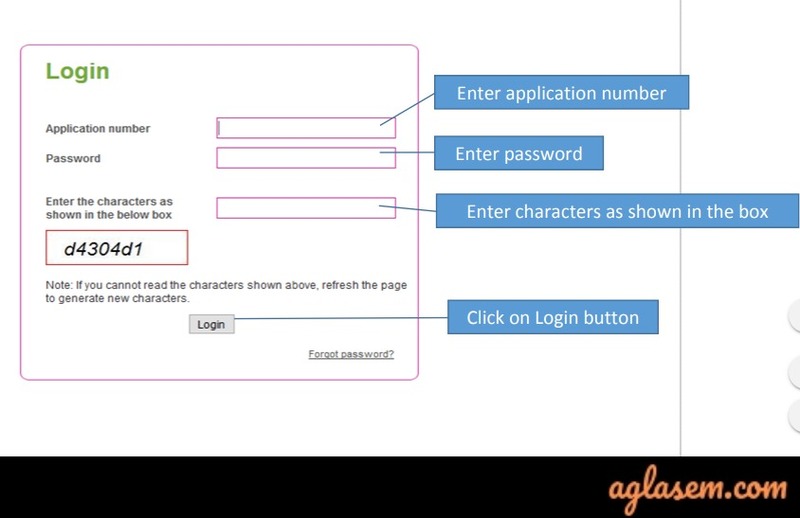 Q. I have forgotten the login password/application number, what should I do? A. No need to worry, you can recover both. We have explained the process above. Q. I submitted the application form but not the fee. Can I do the slot booking? A. No, the University clearly stats that only those candidate can do the slot booking who have submitted the application form and fee. Q. I have booked the slot but I have another paper on the same date. What is the process to change the booked slot? A. Unfortunately, the candidates cannot change the slot. That is why we suggest that the candidates carefully book the slot. Q. I have done VITEEE Slot Booking but cannot view my admit card. What to do? A. Candidates should not worry in this situation. At times it takes some time for the system to generate the admit card. Wait for 24 hours, if the admit card is not available until then contact the university. Q. While confirming the slot, I was logged out. What should I do now? A. VITEEE Slot Booking application is a real-time application. Candidates need to do the booking within 60 minutes. So, if you were logged out because the time ended then you need to book the slot again. In different cities, the examination will be held on different dates. The candidates can check the exam date of VITEEE for each center from below and then do the booking. VIT university intakes admission in their B.Tech courses on the basis of their entrance exam that is held annually all over the nation and abroad. This entrance exam is known as VITEEE (VIT Engineering Entrance Exam). VITEEE is a common entrance exam for VIT Vellore, VIT Chennai, VIT-AP and VIT Bhopal. The selection of the candidates is done on the basis of rank in the exam. The exam is held in online mode. There are MCQ type questions and the total duration of the exam is 02 hours and 30 minutes. The question paper has questions from Physics, Chemistry and Mathematics and English. A section is Biology is also there. The candidates who wish to take admission in the B.Tech. Bio-stream Degree programmes have to attempt the Biology section. Negative Marking: There is no negative marking for an incorrect answer. If you have any queries regarding VITEEE Slot Booking 2019, please feel free to ask in comments below. Try to log in from other browser. Ma’am how to do correction in DOB in my application form of vit now ?? You can change your DOB at the time of counselling. What should I do if I failed to book a slot…its 23 march today…is there any way i can still appear for exam..? Sorry but under no circumstance, the request to change the subject will be done. i didnt receive my password till now…i have sent a mail to the respected email address too….i followed the same process as above to retrieve my password for slot booking…does it usually take this much time??? Yes it take some time. Sorry, now the process is over. I missed the slot booking for VITEEE-2019.what shall I do to appear for the exam as I already paid and submitted application form for the test. I am NRI student based in dubai.Please advise me further necessary cation.